Beach huts come in all manner of styles. It can be challenge to convince Australians to see their own country before they turn grey and nomadic. But, as Sue Williams writes, if you won't take our advice on the virtues of talking a holiday at home how about being inspired by these foreigners' love of travelling down under. They come for our sun, beaches, laidback cities, alluring landscapes and oddball animals. But our visitors from overseas often leave with memories quite different to the ones they imagined they'd capture. So Traveller, to mark the Australia Day weekend, decided to ask six people who would be most in the know about Australia for their frank opinions on what we do best. Here is the panel and their answers. Stein travelled all over Australia on his first trip here as a 19-year-old in 1967, and began returning regularly in the early 1980s. These days Stein, 68, a restaurateur who also fronts his own TV shows and has written a number of cookery books, visits five times a year, and is co-owner of the restaurant at boutique hotel Bannisters, on the NSW south coast at Mollymook. 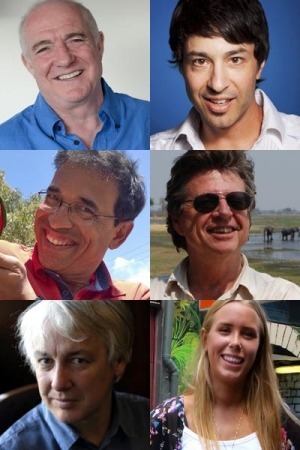 The panel: (clockwise from top left) Rick Stein, Arj Barker, Graham Boynton, Sonia Ruyter, Nicholas Shakespeare, Harsha Bhogle. Bhogle, the nation's equivalent of Richie Benaud, as the face and voice of Indian cricket. An award-winning commentator, he also has his own TV chat show and has written books on the sport. Bhogle, 53, has visited Australia numerous times and is currently preparing to return for the 2015 ICC Cricket World Cup which starts in Australia and New Zealand on February 14. Shakespeare, who grew up in the Far East and South America, has written a number of award-winning novels and biographies. Among his best known are The Vision of Elena Silves, The Dancer Upstairs, a biography of Bruce Chatwin, Snowleg – longlisted for the Booker Prize – and In Tasmania. His new book just out is Oddfellows, with Random House about the only attack on Australian soil in WWI. Shakespeare, 57, lives in Tasmania. Arj Barker has been a frequent flyer to Australia since he first visited in 2000 to appear in the Melbourne International Comedy Festival. He now tours the world with his stage shows, is a regular on the hit HBO TV series Flight of the Conchords and appears on late-night United States talk shows. Barker, 40, is back touring Australia with his Get In My Head show from February 13. Boynton is a Zimbabwean-raised, English-born travel writer who has worked in Africa, the United States and Britain for more than 30 years and was until recently the travel editor of The Daily Telegraph and Sunday Telegraph British newspapers before setting up his own consultancy. Boynton, 62, he has visited Australia six times, touring extensively. Ruyter has been in Australia for five months, and is planning to stay at least seven more. She's travelled widely so far during her stay and is now in Sydney, planning her next big trip north. Ruyter, 18, says she couldn't imagine a greater contrast to her native Sweden, and her home in Stockholm. WHAT IS THE ONE PLACE IN AUSTRALIA EVERYONE SHOULD VISIT? Rick Stein Uluru. Walk around the base and eat dinner under the stars there. It's a very special, spiritual experience. There's nothing like it anywhere else in the world. My first time in Australia, I lived in the desert for three months, working in a maintenance gang on the old railway between Adelaide and Alice Springs. It was fabulous. Harsha Bhogle Sydney Harbour and ideally from above, either from the bridge or, as I was lucky to do, from a sea plane from Rose Bay. I appreciate people have budgets but if they can afford it, they must. Nicholas Shakespeare The Freycinet Peninsula on Tasmania's east coast. Because, as the Danish convict (and former king of Iceland), Jorgen Jorgensen, observed: this is a view "impossible for the most luxurious imagination to conceive more lovely within the whole circle of the creation". Arj Barker Everyone should visit nature to see the beautiful forests and wildlife because it's so diverse and different from anywhere else on earth. Yes, some of it can kill you, but these days it's probably the safest place to be. Graham Boynton The Mornington Peninsula, Victoria. Melbourne is a great city and the peninsula is lovely; very pretty and with extraordinary wines. It's wonderful to tour around. 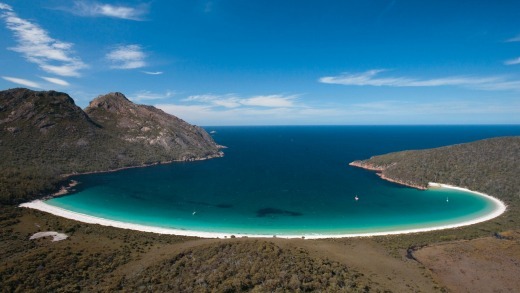 A must-visit: Wineglass Bay, Freycinet Peninsula,Tasmania. Sonia Ruyter Byron Bay, NSW. Everyone is so laidback and calm and relaxed, and people even walk around barefoot. It's so different to everywhere in Europe. We'd never have anywhere like that in Sweden. WHAT'S THE ONE THING EVERYONE SHOULD DO? Stein Go on a rural roadtrip around country NSW. It's the most wonderful, interesting part of the world with lovely green pastures, and red earth. It's a part of Australia that so many people miss. Bhogle Visit the Barossa Valley in South Australia and I absolutely love Admirals Arch, the spectacular rock formation at Kangaroo Island with its fur seals. Shakespeare Walk to Wineglass Bay, Tasmania, then across the isthmus to Cooks Beach, and back in a circle to Coles Bay, to appreciate what Jorgensen meant. Barker They ought to hug a koala on the steps of the Opera House while eating a meat pie floater. Boynton Watch cricket at the MCG. WHAT'S SOMETHING OR SOMEWHERE EVERYONE SHOULD DEFINITELY EAT? Stein Fresh seafood – sardines and swimmer crab from Western Australia and prawns from anywhere. Also, Australian mangoes, avocados and white peaches. And drink shiraz from the Barossa, chardonnay from the Mornington Peninsula and semillon from the Hunter Valley. Bhogle I'm vegetarian and those who aren't keep reminding me of what I am missing in Australia, but I've never struggled. It's a great eat-out country with a huge variety of cuisines. and this is where, in Melbourne really, that my love for coffee was reinforced! Shakespeare Oysters. Those grown out in Great Oyster Bay in Tasmania by Melshell Oyster Farm are the best in the world. Ideal with a Louis Pinot noir from the local Freycinet vineyard. Barker My favourite restaurants at the moment are the Taj Mahal in New Farm, Brisbane (I ate there nine nights in a row once), Rockpool in Melbourne and Sydney, and Gauchos in Adelaide. Boynton The food is fantastic at Maggie Beer's Farm Shop in the Barossa. It's very clever, light food. Ruyter Kangaroo hamburgers at the Cargo Bar in Darling Harbour in Sydney. I wasn't sure about it at first, but they're surprisingly nice. WHAT'S SOMETHING SPECIAL EVERYONE SHOULD TRY TO EXPERIENCE, AT LEAST ONCE? Stein An Australia Day in Sydney. People from abroad wouldn't realise how much it means to the locals and how special the atmosphere is. Bhogle Meet and talk to people. I find Australians easy to be friends with, they are chatty, have an opinion on most things and are good company. Far too often, we see monuments and touristy places but I think you understand a country best if you try and mingle with the people. Shakespeare The Museum of Old and New Art in Hobart. It's fun and provocative and risk-taking, and appeals to old and young alike. Barker Hang-gliding in Byron Bay. You can do a tandem flight for about $150 on the day, or get trained up to fly solo within a couple of weeks for around $1500 (which I did and made two solo flights). If you dream of flying, this is the closest you will get to it – and where else will you spot a pod of dolphins, a turtle, a shark, a manta ray, and a goanna from the air? Boynton A Long Table Lunch at the Artisans of Barossa, a group of like-minded producers from seven different wineries in the Barossa Valley, in Vine Vale. The food is outstanding and is by chef Michael McNamara. It's a fantastic experience! Ruyter Travel along the east coast in a campervan, and sleep out under the stars. That's such an Australian thing to do and it's absolutely wonderful. Is there a place to be avoided? Rick Stein: Circular Quay on New Year's Eve and the Top End in the rainy season. Arj Barker: I do my best stay away from hospitals and police stations whenever I travel. Graham Boynton: I wouldn't say there's anywhere in Australia to be avoided, but then as visitors, we probably don't see your worst areas. You must have something like The Projects [bad state housing] but I haven't seen them. Sonia Ruyter: Townsville. Everywhere I've been in Australia, people have been very friendly, but not in Townsville. You can say Hello to people and ask them for directions anywhere, but in Townsville, they just walk past. What's the strangest thing that's struck them about Australians? Rick Stein: Aussie BBQs are very funny. They tell you not to bring anything, but they don't mean it at all; they expect you to turn up with an esky full of beer, nibbles and ice creams. Then all the men gather around the BBQ and the women go to the kitchen. It's very tribal. Nicholas Shakespeare: Up in Gladstone, in north-east Tasmania, I met a couple of young men who went out at night with a car battery and electrocuted a patch of bush, causing thumb-sized earthworms to wriggle to the surface. They then sold these worms to fishermen on the mainland for $3 a packet. Some nights they earned up to $2000 or more. Arj Barker: I noticed that some Aussies refer to an event called a 'Sunday Session' whereby they get drunk on a Sunday afternoon. I do however believe this tradition exists in other countries where they simply refer to it as 'Sunday'. Graham Boynton: When you first hear Australians talk, it can be a bit hard to understand all the slang you use. It seems there's no word that can't be shortened, from reffos for refugees, to bottle-os for bottle shops and salvos to Salvation Army. It's quite strange to our ears – and very funny! Sonia Ruyter: I'm amazed at how friendly and warm Australians are. People in Sweden aren't like that at all. But here, they're very welcoming. "Insofar as I had accumulated my expectations of Australia at all in the intervening years, I had thought of it as a kind of alternative southern California, a place of constant sunshine and the cheerful vapidity of a beach lifestyle, but with a slightly British bent – a sort of Baywatch with cricket . . ."
"Go into the middle of Australia and see how empty it is. You can't face emptiness long. You have to come back and do something to keep from being frightened at your own emptiness, and everything else's emptiness. It may be empty. But it's wicked, and it'll kill you if it can." "[The people of Sydney] had impressed themselves upon the universal fancy as an esoteric sub-species of Briton – sunburnt, healthy, loud, generous, misogynist, beery, lazy, capable, racist and entertaining, strutting along beaches in bathing caps carrying banners, exchanging badinage or war memoirs in raw colonial slang, barracking unfortunate Englishmen at cricket matches they nearly always won." 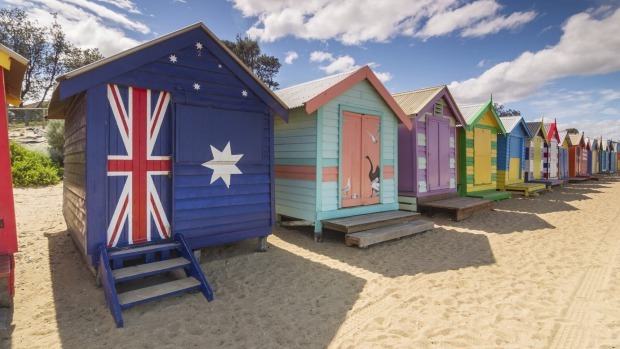 What four major foreign travel guidebooks recommend as their holiday must-sees in Australia. "It's a glorious 2000 km-long underwater coral fairyland with electric colours and bizarre fish life—and it comes complete with warm water and year-round sunshine"
"No other city has beaches in such abundance, and few have such a magnificently scenic harbour...board a ferry, walk from one side of the bridge to the other, and try to spend a week here, because you're going to need it." "Folks who come from such skyscraper cities as New York and London can't get over the moisture-dripping ferns, the neon-blue butterflies, and the primeval peace of this World Heritage rainforest stretching north, south, and west from Cairns". "It's easy. Anchor in deserted bays, snorkel over dazzling reefs, fish for coral trout, and feel the wind in your sails". 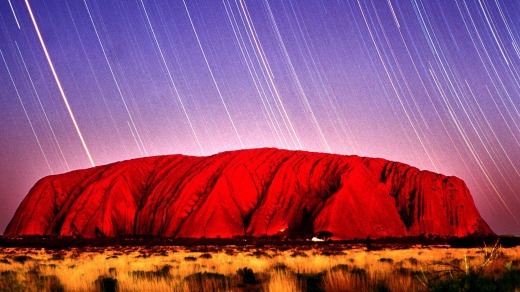 "Uluru and Kata Tjuta demand at least 3 days to see everything there is to offer". Seeing the landscape through the eyes of Australia's indigenous people...will give you a different perspective on Australia, no matter which part of it you are in. "Nowhere in Australia does food culture better: edgy urban cafes, stylish bohemian bistros and glamorous fine-food restaurants." "The Franklin River not only provides one of the wildest white-water roller coasters on Earth, it is the only means of access to an astounding rainforest wilderness." "There are some fantastic hikes in the Flinders Ranges National Park but few top the spectacular scenery at the elevated basin of Wilpena Pound." "On two wheels or four, the 280km route along the surf-battered cliffs bordering the Great Ocean Road is perfect road-trip material, and can also be followed as a rewarding hike." "Easily accessible from Adelaide, the Barossa Valley, Adelaide Hills, McLaren Vale, Clare Valley and Coonawarra vineyards are all wonderful places to unwind. For more information, see Wineries and B&Bs in the hills & McLaren Vale wineries". "With its rainforest, crater lakes and abundant wildlife, you could spend days exploring the Atherton Tablelands". "Remote and subject to extreme weather, this vast World Heritage area—it covers a fifth of Australia's island state—protects one of the few expanses of temperate rain forest on Earth." "The largest sand island on Earth, Fraser lies just off Queensland's coast, about 200 km (124 miles) north of Brisbane. This exquisite island is both ecologically precious and extremely popular for soft-adventure holidays—a sometimes problematic combination." "Sunlight refracting off a mist of eucalyptus oil gives the Blue Mountains, west of Sydney, their distinctive hue. The variety of eucalypts (commonly called gum trees) across this mountain range's varied habitats was integral to its World Heritage listing". "This fragile natural wonder contains 400 types of coral and 1500 fish species of every size and almost every conceivable colour combination." "Twenty million years of erosion and weathering have deeply dissected the Bungle Bungle Range into banded, beehive-shape sandstone towers". "X-ray paintings of barramundi, long-necked turtles, and other animals festoon the main gallery at Ubirr Rock in Kakadu National Park. This menu-in-ocher is one of more than 5,000 art sites in the park that collectively date back 20,000 years." "The Opera House is deservedly on everyone's list as a must-see attraction in Australia – it's on the UNESCO World Heritage list, after all – and when you combine it with the iron bulk of Sydney Harbour Bridge, you have one of the great vistas of the world." "Gathered around Lake Burleigh [sic] Griffin is what collectively amounts to the most impressive collection of educational and cultural showpieces in Australia." "Tasmania's grim penal settlement provides something of a crash course in Australia's colonial history. The setting, ironically, is stunning." "International car companies regularly shoot their television commercials on Victoria's stupendously scenic coastal drive." "Springtime, beginning in September, is when the countryside around Perth and southern West Australia is awash with technicolour blooms"
"Feel the pulse of tropical Darwin while eating, drinking and shopping at this outdoor market. Read more about Mindil Beach Sunset Market..."